In the Indian Ocean: Tropical cyclone 07b (Gaja), located approximately 623 nm south-southwest of Calcutta, India, is tracking west-southwestward at 06 knots. Kuwait – State-owned Kuwait Petroleum Corporation (KPC) has suspended work at all of its companies on Wednesday due to the extreme weather which has hit the Gulf state in recent days bringing heavy rains and floods. The spectacular centerpiece of Venice, St Mark’s Square, now floods more than 60 times a year, up from four times a year in 1900. Recent storms reportedly helped cover over 70% of the city in water, which rose by up to 156cm above its normal level. Upcoming research conducted with our colleagues at the National Research Center of Venice (CNR) shows that, without intervention, within 50 years this kind of flooding could occur with nearly every high tide. In fact, some experts have argued that Venice will be gone by the year 2100. 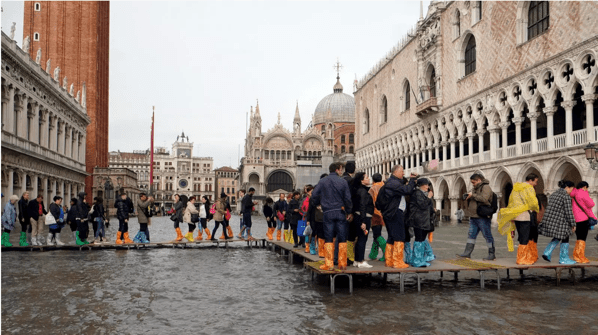 The increase in flooding in Venice is due to the combined effects of land subsidence causing the city to sink, and climate change causing the global sea level to rise. But the city’s chosen solution to the problem, an unfinished scheme of 78 storm gates known as MOSE, is likely to cause damage to the ecological health of the surrounding lagoon and, in the long run, could have no effect on Venice’s preservation. Venetians have been managing Venice lagoon with engineering since the 12th century. The city is built on 118 small islands drained by a network of canals and located within a tidal lagoon sat between the Italian coast and several barrier islands known as the Murazzi. Interventions have included diverting six major rivers away from the lagoon to stop its waterways filling with silt, rebuilding and extending the Murazzi and reducing the inlets between them from the original nine to three. Venetians have also combated flooding by periodically raising pavements and walkways and building embankments, but this is no longer possible without damaging the city’s architecture. So in 2003, the MOSE project was launched as a way of protecting Venice from the worsening floods. Records held in the city show the Venice sea level has consistently risen by a total of 26cm since 1870. Around 12cm of that comes from the fact that Venice’s islands are subsiding because of the amount of water removed from the aquifer beneath Venice lagoon. Further measurements show that sea level is still rising 2.4mm a year. This entry was posted in Floods, Storms and tagged kuwait, storms, Venice. Bookmark the permalink.